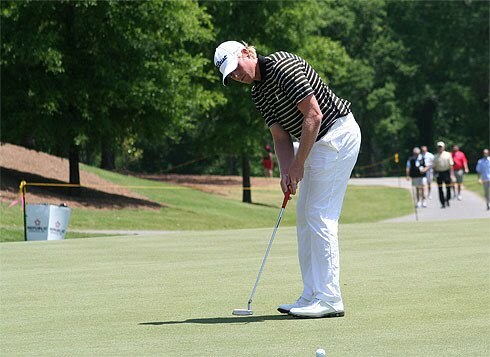 Bradley Iles of New Zealand rolled off four consecutive birdies on his last four holes to finish 5 under and take a share of the clubhouse lead at the 2010 Stadion Athens Classic at UGA on the Nationwide Tour. Almost simultaneously on the connected 9th green, Martin Piller muffed a short chip shot from the back of the green and bogeyed the hole, dropping him one shot out of the lead. FOR THE LEAD: Nationwide Tour player Bradley Iles (in black) lines up his birdie put on the 18th Hole of the Stadion Athens Classic at UGA in Athens, GA on Thursday, April 29, 2010. Eye on Sports Media/2010. Iles played the front nine at even par 35, offsetting a birdie on the 556 yard par 5 7th hole with a bogey on the 443-yard par 4 9th. He recovered with a birdie on the 475-yard 10th hole. He started his birdie run on the par 4, 422-yard 15th hole, and finished it with birdies on the 567-yard par 5 17th and and 488-yard par 4 18th. DID I JUST DO THAT? : Nationwide Tour player Martin Piller muffed this chip shot to bogey his 18th hole and lose a share of the lead at the 2010 Stadion Athens Classic at UGA on Thursday, April 29, 2010. Eye on Sports Media/2010. Piller started his round on the back nine, also snagging a birdie on the difficult 18th. He had a run of 4 birdies in 5 holes (4 - 8), before hitting his approach on 9 just over the green, about 6 inches past a drain cover. For some reason, he pushed his chip shot about 6-8 feet right, missing the subsequent putt. 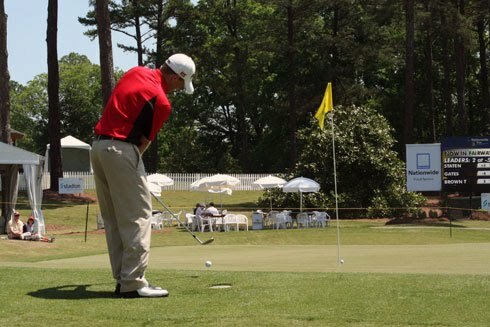 IT'S ROLLING: Nationwide Tour player Mark Anderson of Hilton Head, SC follows his birdie putt on his 18th hole to tie for the lead at the 2010 Stadion Athens Classic at UGA on Thursday, April 29, 2010. Eye on Sports Media/2010. Also sharing the lead at -5 are Mark Anderson of Hilton Head, SC, who mixed 6 birdies and one eagle, and the Nationwide Tour's money leader Bobby Gates of the Woodlands, TX, who birdied 4 out of his 6 last holes to tie for the lead. The computers are down, but as of now it appears that Gates has the most birdies of the day with seven. Bobby Gates started the 2010 Nationwide Tour season with a victory at the Michael Hill New Zealand Open and the next week finished 3rd at the Moonah Classic in Australia. He missed the cut in 2 out of the next 3 tournaments, splitting those with a tie for 63rd at the Pacific Rubiales Bogata Open in Colombia...Martin Piller was Gates roommate at Texas A&M...about 5 or 6 players in the Stadion Athens Classic field have wives or girlfriends as their caddy.